Picture 14A-34. Cars of three generations pose with some of the men who worked on them. Car no. 47, at the left, dates from 1909; no. 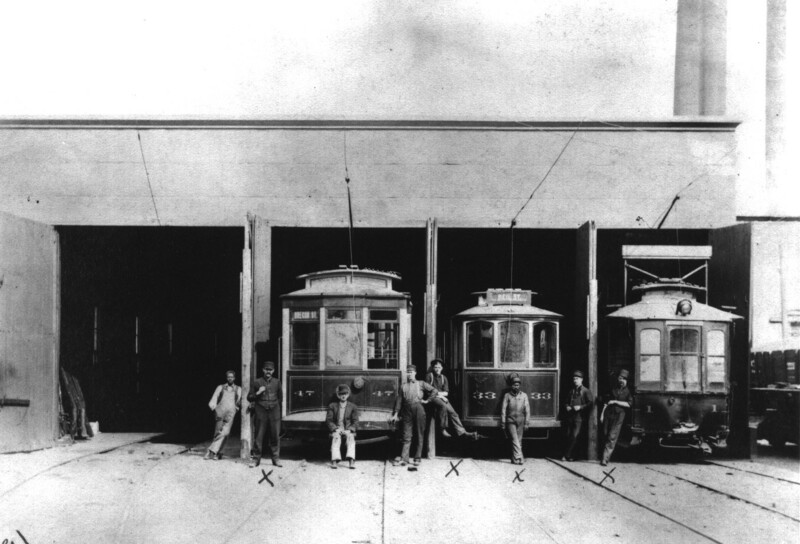 33, center, dates from about 1902; and tower car no. 1, right, from the 1890s. No. 1 sports archaic add-on vestibule windows and a roof-mounted headlight. No. 33 has a roof-mounted route sign, while no. 47 has its route sign in a vestibule window. Notice also how no. 47 has a larger, wider body and clerestory roof. The men marked X are, left to right: John Key, Ora Patterson, Walter Hall, and Charley Bartley.